OTTAWA – The Canadian Paralympic Committee (CPC) is pleased to announce that three-time Paralympic swimmer Stephanie Dixon (Brampton, Ont. 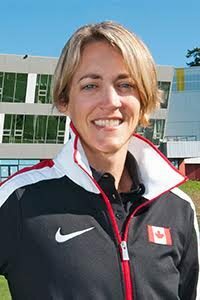 now living in Whitehorse, Yukon) has been named Team Canada’s Chef de Mission for the Toronto 2015 Parapan American Games. Dixon competed at the Sydney 2000, Athens 2004 and Beijing 2008 Paralympic Games and won a total of seven gold, 10 silver and two bronze medals. She still holds the world record in the 100-metre backstroke in her class (S9). At the 2007 Parapan American Games, she won six gold and one silver. Dixon has an extensive background with the Paralympic movement in Canada. She represented Canada as an athlete for almost 15 years and now works promoting parasport across Canada through roles such as a keynote speaker, blogging, broadcasting and mentoring. She was part of the CPC’s broadcast team at the Sochi 2014 Paralympic Winter Games, TV host of the 2013 IPC World Swimming Championships in Montreal and is an athlete mentor with CIBC’s Team Next. She also works with Sport Yukon as a communications coordinator and speaks at schools across the Yukon. Originally from Brampton, Ontario, Dixon swam with the Dorado Stars Swim Club and Cobra Swim Club before heading out to the University of Victoria where she earned a B.A. in Psychology. She won the 2006 University Of Victoria Woman of Distinction Award as well as the 2004 and 2005 University of Victoria Female Outstanding Athlete of the Year awards. “I have an incredible passion for the Paralympic Movement as it has largely shaped the person who I have become and I have witnessed it change the lives of others,” said Dixon. “The awareness of the Paralympics has grown considerably across the world and I know that here in Canada, we are in the midst of big, groundbreaking changes in the way that Canadians perceive the nature of sport, the limitations of what is possible and what it truly means to be a champion. As Assistant Chef de Mission, Dixon will be a spokesperson for the Canadian Parapan Am Team and will support the leadership provided by Chef de Mission Elisabeth Walker-Young, also a fellow Paralympic swimmer. Their focus is on pre-Games preparation and on building a support team to ensure an optimal environment of success for the athletes. They will also promote Canada’s athletes and raise awareness of Paralympic sport and the Canadian Paralympic Team.